Less than a month ago, The Boy and I moved into our first house. We were excited, thrilled, and so ready to finally have a place of our own. Sadly, there was one of our party who wasn't quite as excited as we were: our dog, Mokey. Spending the last few weeks helping her get situated to the house has been quite the reminder of how far she has come since we first adopted her. And as I continued to help her get comfortable and feel secure in her new surroundings while still trying to unpack and prepare my blog post for this week, it occurred to me that it might be time to introduce our fluffiest honorary lady, Lady Mokey “Great Scott” Von Barkenberg of Backyardia. There are two important things to know as I start to tell Mokey’s adoption story. One: She was supposed to be a really nice piece of jewelry, and two, she wasn’t the dog we thought we wanted. Me: I’m having a really hard time deciding what to get. This is starting to feel more like work than the excitement of getting something I really want. The Boy: Well, what else would you want? What did you think you would have by now? Me: Well, all I remember wanting when I was a kid was my own dog. I used to think to myself that as soon as I was a grown-up, I would get one. The Boy: Ok, let’s get a dog. We had always intended to get a dog. The timing just never felt right since we were dog sitting The Boy’s mother’s devil of a chihuahua on a regular basis and were currently taking care of a friend’s Pomeranian while she moved cross country. It was one of times that might never actually be “right” and I wanted a dog with every fiber of my being. So long shiny necklace, hello picking up poop off the sidewalk. I will spare you a lot of details related to the actual search for Mokey. There were a million starts and stops on Petfinder, good and bad volunteers (including one who forgot to tell us a dog was adopted and almost let us drive an hour and a half to her house anyway), and rescue agencies with requirements a mile long… And then there was the agency we got Mokey from. 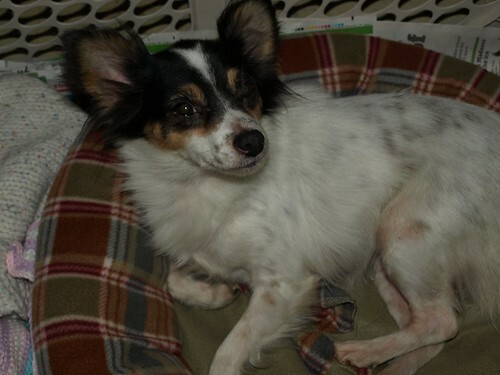 Backing up a little, we first found a listing for the dog we thought we wanted - a tri-color, full Papillon named Midge. She was cute, the size we wanted, and the rescue was ready to stick her on a transport to an adoption event in about two weeks. Awesome! If Midge was everything the woman who ran the rescue told me, this was a done deal. Over the next two weeks, I emailed the woman a few times asking quesions and chatted on the phone with her the night before the event. She confirmed that Midge was going to be ready to meet us the next day. I can’t even tell you what time the adoption event was suppose to happen. All I know is that it took forever to get there, and it was raining that kind of cold spring rain that makes you wonder if you will ever feel warmth or joy again. By the time we got to the PetSmart in New Hampshire, we were told by the staff that the guy driving the transport would be at least an hour late. So we waited, for several hours. Half an hour before the store was supposed to close, the driver finally showed up. He went down the line confirming each person and the dog they requested to meet. By this point in the story, it doesn’t take a genius to have figured out that Midge was not in his van. The store was closing around us, I hadn’t eaten since breakfast, and all I could think of was that the whole thing was a wash. I wasn’t sure if I should be mad or just go into the corner and cry. But then the driver asked us if we might be interested in another dog. For the past 7 months, he had been driving a certain female papillon mix named Tikki from Kentucky to NH to attend adoption events. She had one disastrous overnight adoption because the woman was convinced there was something wrong with the dog. Basically, this pooch was too aloof. Here is the story the driver gave us: the woman dumped her in the snow as soon as they got home. The dog was terrified (puppy mill dog from the south who'd probably never saw snow before) and spent the rest of the evening hiding from the woman. The woman was convinced the dog was broken, the driver realized this woman was not ready to own a rescue and picked up Tikki the next morning. Would we be interested in a quick meet and greet with Tikki? We followed the driver out into the misting rain where he pulled a crate from the back of the van. He opened the crate and out ran Tikki. She made a loop around all the people giving each a quick sniff and I made a mental note about how all the NH based volunteers both knew her and were thrilled to see her. This was encouraging. Tikki was put on a leash and The Boy walked with her around the parking lot a few times. When they stopped walking, Tikki looked up at the Boy. Their eyes met, some tiny invisible string quartet began to play in the dark recesses of The Boy’s mind...it was love.